“Oriskany… de-e-e-e-PAR-ted,” the retired Bosun’s mate called out, a crisp salute and rigid military attention belying the tear in his eye. He had served on the USS Oriskany, an Essex class aircraft carrier that last saw active duty in 1975. Since then, the “Mighty O” languished, too small and obsolete to serve, too obscure to claim a spot as a museum or tourist destination—until now. 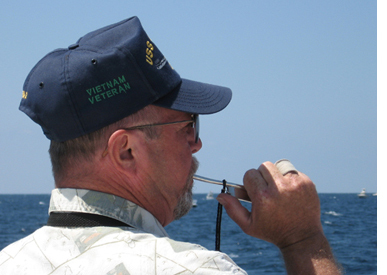 The unmistakable low-high-low whistle of his Bosun’s pipe followed as our hushed group watched the bow of the aircraft carrier slip below the surface of the water. An easy three-hour interstate highway drive from New Orleans, the USS Oriskany artificial reef site, about 25 miles offshore southeast of Pensacola, Florida, is the newest must-do dive for those who are serious about their scuba experiences. 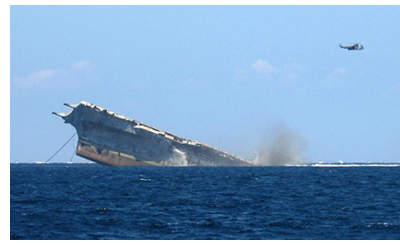 Detonated by naval munitions personnel in May 2006, the Oriskany sank in just thirty-seven minutes, coming to rest intact and upright, as intended. Today, the site lives up to the hype surrounding her sinking. Divers’ reports and photographs reflect the awe of such a large vessel sitting regally on the flat desert sand floor of the Gulf of Mexico. It’s the world’s largest artificial reef. The Oriskany’s sinking was the first of a planned armada of retired naval vessels to be recycled into reefs in the waters off Pensacola. As the only aircraft carrier available in a Navy program to convert surplus and decommissioned vessels into artificial reefs, the Oriskany’s final resting spot was the subject of vigorous competition. Northwest Florida local officials prevailed, claiming that Pensacola Naval Air Station is the “Cradle of Naval Aviation,” having launched the career of every Navy and Marine pilot who ever hooked a restraining cable on her deck. The only other “diveable” aircraft carrier in the world is the wreck of the USS Saratoga off the Bikini Atoll in the middle of the Pacific Ocean. Crumpled and lying on her side, she doesn’t compare to the surreal grandeur of the Oriskany. Through the wavy currents, the “Mighty O” appears able to sail into battle again tomorrow if only she wasn’t completely submerged and surrounded by fish. Divers can circle the ship’s tower, visible from the water’s surface, and view the entire deck without descending below 100 feet. This is considered an advanced dive for recreational divers and a technical one for those wanting to descend to the hull and deck. However, some local operators are willing to work with less experienced divers who meet certain criteria. If you’re a certified scuba diver visiting Pensacola, Florida, New Orleans, Louisiana, or nearby, don’t miss this world-class destination dive.